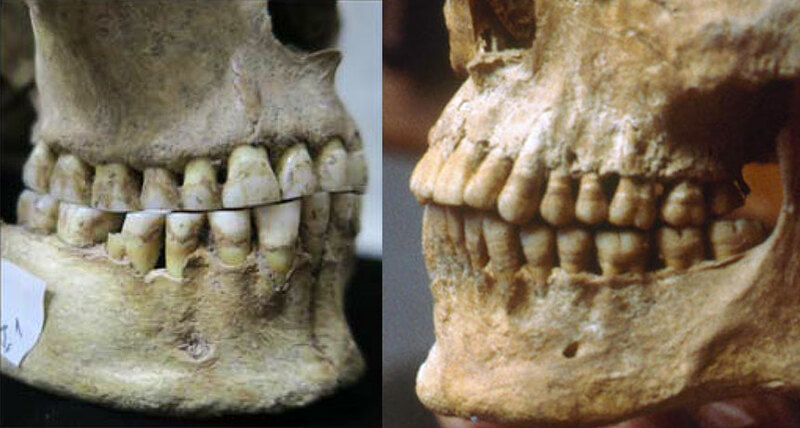 SOUND BITES The skull of an ancient female hunter-gatherer from Romania (left) lacks a slight overbite seen in the 2,500-year-old skull of an adult male from Greek civilization (right). Humankind’s gift of gab is not set in stone, and farming could help to explain why. Over the last 6,000 years or so, farming societies increasingly have substituted processed dairy and grain products for tougher-to-chew game meat and wild plants common in hunter-gatherer diets. Switching to those diets of softer, processed foods altered people’s jaw structure over time, rendering certain sounds like “f” and “v” easier to utter, and changing languages worldwide, scientists contend. People who regularly chew tough foods such as game meat experience a jaw shift that removes a slight overbite from childhood. But individuals who grow up eating softer foods retain that overbite into adulthood, say comparative linguist Damián Blasi of the University of Zurich and his colleagues. Computer simulations suggest that adults with an overbite are better able to produce certain sounds that require touching the lower lip to the upper teeth, the researchers report in the March 15 Science. Linguists classify those speech sounds, found in about half of the world’s languages, as labiodentals. And when Blasi and his team reconstructed language change over time among Indo-European tongues (SN: 11/25/17, p. 16), currently spoken from Iceland to India, the researchers found that the likelihood of using labiodentals in those languages rose substantially over the past 6,000 to 7,000 years. That was especially true when foods such as milled grains and dairy products started appearing (SN: 2/1/03, p. 67). “Labiodental sounds emerged recently in our species, and appear more frequently in populations with long traditions of eating soft foods,” Blasi said at a March 12 telephone news conference. Yale University linguist Claire Bowern, who did not participate in the new study, agrees. If certain sounds become easier to pronounce, the odds of those sounds appearing in words increases. But changes in how words are actually spoken still may not happen, Bowern says. So evidence of labiodentals’ rapid incorporation into many languages comes as a surprise, she says. Linguists traditionally have thought that humans have always been capable of making all sounds used in the roughly 7,000 languages still spoken today. Crucial elements of speech anatomy, such as a larynx, or voice box, positioned low in the neck, evolved in now-extinct Homo species by 500,000 years ago. Homo sapiens thus emerged around 300,000 years ago biologically prepared to talk. Then in 1985, linguist Charles Hockett argued that hunter-gatherer languages virtually never include labiodental sounds. That’s because by young adulthood, heavy tooth wear from intense chewing of tough foods triggers dental changes that move the upper teeth directly on top of the lower teeth, he contended. A resulting “edge-to-edge” tooth arrangement makes it harder to form labiodental sounds, Hockett reasoned. If true, his proposal meant that the introduction of soft foods in farming societies should have safeguarded overbites and raised the likelihood that spoken languages would include labiodentals. The new study’s computer simulations support Hockett’s idea. They show that a transition from an edge-to-edge bite to a slight overbite makes it substantially easier to utter labiodental sounds. What’s more, a statistical analysis of languages and lifestyles for more than 2,400 populations around the world found that, on average, hunter-gatherers use about one labiodental sound in their speech for every four spoken by people in societies that produce and process food. A closer examination of hunter-gatherer languages in Greenland, southern Africa and Australia found few instances of labiodental sounds. Historical records indicate that words with labiodental sounds were borrowed during contacts with people from industrialized nations, the researchers say. A tendency for some commonly mispronounced sounds to become widely used can help explain labiodentals’ rapid incorporation into many languages, says evolutionary biologist Mark Pagel of the University of Reading in England. If labiodentals became easier to pronounce relatively recently, making them more likely to be spoken by chance, those sounds could have quickly become embedded in lots of native tongues, he speculates. Although the new findings are “fundamentally correct,” human overbite increased much more after the industrial revolution, which began in England in the late 1700s, than after the introduction of agricultural foods 6,000 years ago or more, says biological anthropologist Robert Corruccini of Southern Illinois University in Carbondale. Industrialized food processing and canning — and perhaps the adoption of forks in Western societies, so that food could be cut with two hands rather than by grasping it with one hand while gripping a portion with one’s front teeth — played big roles in preserving overbites, he contends.